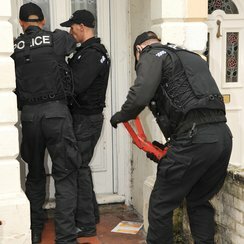 250 police officers have carried out drug raids across Southampton, with 19 people being arrested. 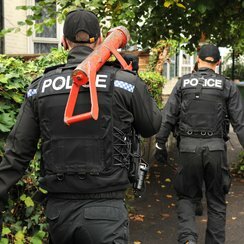 The warrants were part of Hampshire Police's Operation Fortress, the campaign bringing together partner agencies throughout the city to reduce drug-related violence. Seventeen warrants were carried out this morning in Southampton and one in London and 19 people have so far been arrested for offences linked to drugs. Investigations are ongoing in connection with the warrants at each address. The warrants this morning involved approximately 250 police officers and staff who were joined by partners in drug treatment services to help identify vulnerable drug users and get them into support. Throughout the rest of the day and over the coming week, the Operation Fortress van will out and about to update communities, let them know what's happening and get feedback. "I'd like to thank everyone who has supported the campaign so far, from people in our communities who have come forward with information, to partner agencies who've taken on the Operation Fortress brand and made it their own. "Today's police action sends a clear message that drug dealing will not be tolerated in our city and that we will make Southampton a hostile place for anyone thinking of coming here to pursue this criminal enterprise. "Our efforts to restrict the supply of drugs are just one element of Operation Fortress. The campaign is also bringing together partner agencies across the city with the aim of reducing the demand for drugs and helping communities to rebuild free from the fear of drug crime. "This month, for example, an Operation Fortress themed education package will be rolled out to Southampton's schools to highlight to pupils and students the human cost of taking and dealing drugs. "On 27 September, we're asking people to come together across Southampton and organise an event to help promote the campaign and its aims and objectives as part of a day of community action. "Between now and then, the Operation Fortress van will be out and about in local neighbourhoods on reassurance patrols to demonstrate that we're here to stay. If you've got concerns about drug-related crime where you live, come and talk to us." Anyone concerned about drug-related crime where they live can speak to the Operation Fortress team in confidence on 101 or email operation.fortress@hampshire.pnn.police.uk. In an emergency, always dial 999. You can also call Crimestoppers anonymously on 0800 555 111.